As promised, here is the recipe for my homemade lemon curd. I’m not entirely sure how I came by the recipe but it in my old, battered recipe notebook, covered in splat marks and looking decidely dog-eared. It is a traditional lemon curd recipe but the curd it makes is better than anything you will find in a shop. And for those of you who might live up a mountain, I have been reliably informed that it works at altitude too. Well, it does in Breckenridge, Colorado anyway! This lemon curd is gorgeous used as a filling with sweetened mascarpone cheese in a Victoria Sponge. Bliss!!! 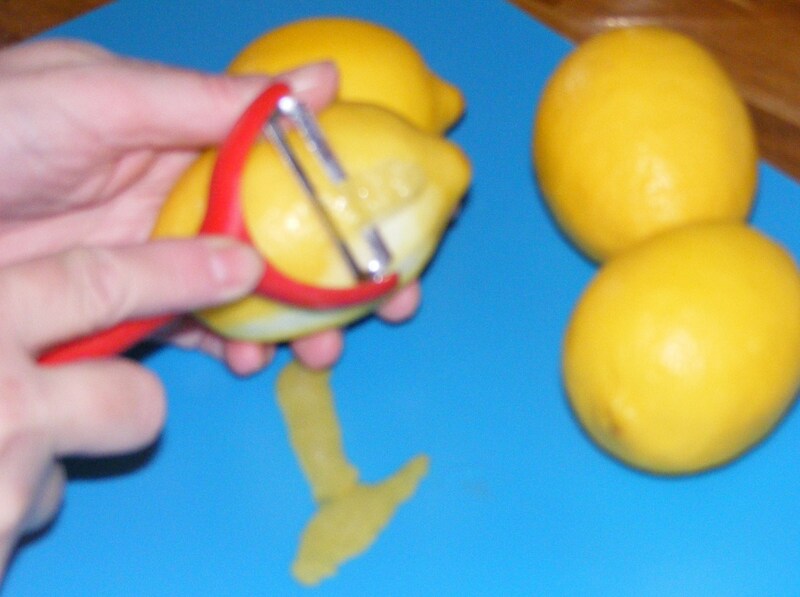 Wash the lemons and remove very thin strips of rind from two of them. I used 3 because they were smallish lemons. I find using a vegetable peeler the best way to remove the rind as it cuts very thin slices without any of the white pith. Cut in half and squeeze out the juice, removing any pips. 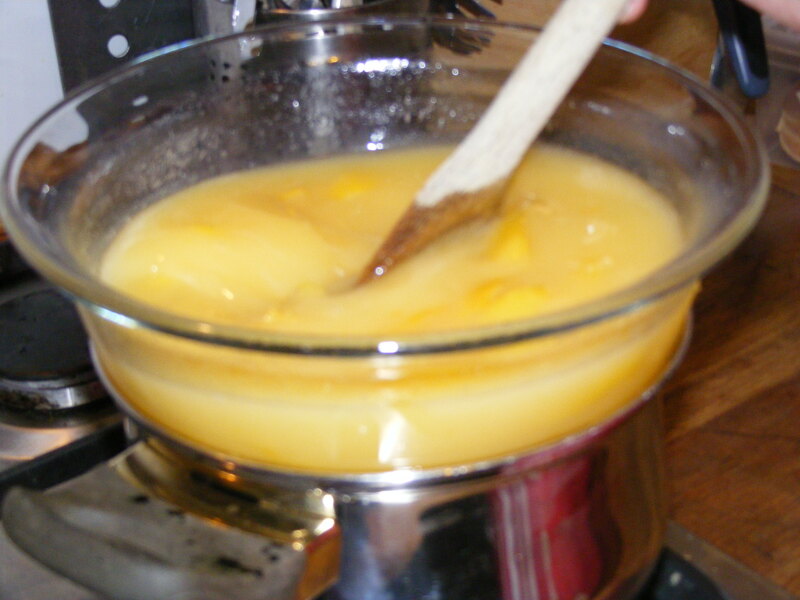 Put the juice and rind, beaten eggs and other ingredients into a double saucepan (or heatproof-bowl over a hot pan of water) on low heat and heat gently until all the sugar has dissolved. I found the best way to test whether it is ready was to put a refrigerated spoon into the mixture, pull it out and look at the back of the spoon. When it coats it thickly, it is ready. 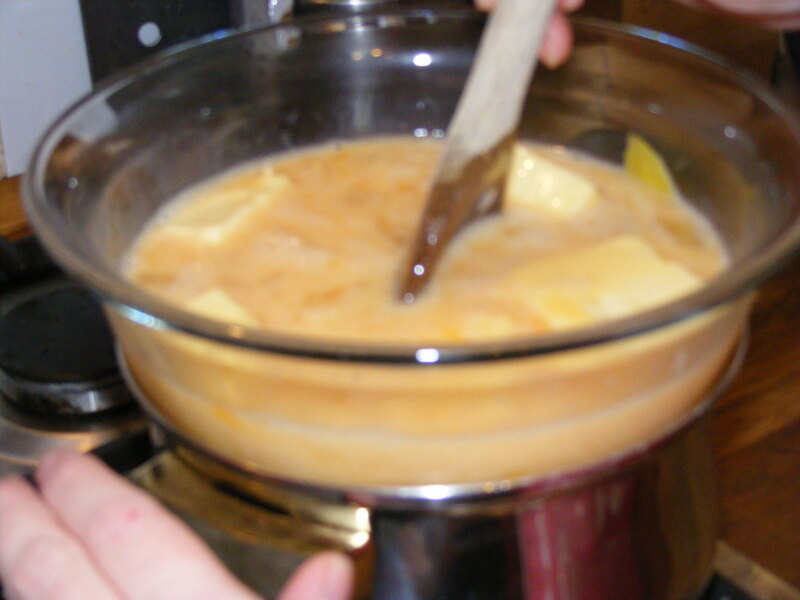 Remove the rind and any possible lumps by passing through a sieve. Turn into hot clean jars (I sterilise mine in the dishwasher) and seal at once. Allow to cool then store in the fridge. They will set overnight. This recipe makes about 2 lbs (900 g) of Lemon Curd. Store it in the fridge and it will keep for about 3 weeks in an unopen jar. Let me know how you get on with it!